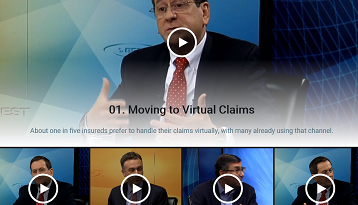 AM Best produces innovative online presentations that explore key issues facing the insurance industry. These content-rich events--some hosted by Best's Review's editors--connect you with industry leaders and consistently generate an enthusiastic response. Be sure to bookmark this page and check back often for updates! Check back frequently for information about upcoming webinars. "How Insurers Are Transforming Their Business through Data, Machine Learning and AI"
"What Insurers Should Know about Four Trends Transforming Asset Management"
"The Future of Claims Management"
"Sudden Impact: How Insurers Are Dealing With the Rise in Head Injury Claims"
"Are We There Yet? How Insurers Can Gauge Their Digital Maturity"
"Why AM Best Changed Its Market Segment Outlook for the Global Reinsurance Sector"
"How the Sharing Economy is Rewiring Claims"
"D2C: How Life and Annuity Insurers Are Reinventing Distribution"
"Inside Today's Surplus Lines Market"
"State of the Global Reinsurance Market"
"Claims: Cyber Intruders Target the Insurance Legal Community"
"State of the Captive Insurance Market"
"Cyber: The Next Frontier in Personal Lines Insurance"
"How Insurers Are Using Hyper-Accurate Location Data to Transform Underwriting"
"Managing Agents Effectively in a Data-Driven World: Five Tips for Success"
"How to Know Your Customer in This Post-Breach Environment"
"State of the Medical Professional Liability Market"
"The Evolving Partnership of Data Analytics and Claims"
"Effectively Managing Multiple Distribution Channels in Today's Changing World: Tips for Success"
"Evaluating Mortgage Risk in Reinsurance"
"How Smart Data Is Remaking Insurance Claims"
"Insurance Careers Month Insurance Leaders Town Hall"
"Conquering with Content: Insurance Marketers Explain What Works and Why"
"NY's New Cybersecurity Regulation: A Producer's Guide to Compliance"
"What This Year's Catastrophes Revealed About Real-World Claims Handling"
"How Insurers Are Using Private Placements to Enhance Their Portfolios"
"How Life Insurers Are Changing How They Motivate and Compensate Producers"
"How Insurers Can Produce and Maintain Complex Documents"
"Hiding in Plain Sight: How Insurers Can Identify Commercial Use Vehicles"
"The Road to Convergence: Global Reinsurance and the ILS Market"
"Reptile Hunters: Insurers' Defense Counsel Responds to Next Wave Plaintiff Strategies"
"Reinventing Distribution: Channel Management in a Rapidly Changing World"
"My Refrigerator Just Boiled the Milk: Cyber Risk and the Internet of Things"
"How Insurers Can Close the Talent Gap"
"Best's Credit Rating Methodology Update - Asia-Pacific"
Helping Boomers & Aging Clients: Is Home the Best Place to Grow Old? "Review of the Universal Best's Capital Adequacy Ratio"
"Understanding the Changing Legal Implications of Cyber Liability"
"Updated & Expanded Impairment Study"
"Succeeding in the Data-Driven Insurance Sales Environment"
"Review of the Property/Casualty Best's Capital Adequacy Ratio"
"Review of the Life/Health Best's Capital Adequacy Ratio"
"What Insurers Should Know about ETFs & Issuers"
A panel of investment professionals reviews the growing use of exchange-traded funds by insurance asset managers, including the strategies employed, advantages, drawbacks, and the widening range of features that allow insurers to better allocate investments. This webinar is sponsored by Cantor Fitzgerald. (Event date: November 10, 2016). "What Insurance Professionals Should Know about Contaminated Drinking Water"
"A Guide to the Interactive Rating Process"
"A.M. Best Analysts Discuss Newly Released ILS Rating Methodology"
"What Insurance Professionals Should Know about Emerging Sports Liability Issues"
"Healthcare Market Trends & Challenges"
"The State of the Global Reinsurance Market"
"The State of the Captive Insurance Market"
"The Legal and Insurance Ramifications of Lead Injuries"
"What's Driving Today's Changing Commercial Auto Insurance Market"
"Data Interrupted: Understanding Today's Cyber Coverage Gaps"
"Securitization of Life Related Traditional Premium Finance Loans"
"State of the Program Market"
"Managing the Risks Associated with the Rapidly Changing Robotics Industry"
"Overview of Best's New U.S. P/C BCAR"
"Revisions to Best's Credit Rating Methodology"
"How A.M. Best Rates Securities Backed by Life-Contingent Structured Settlements"
"How Technology and Analytics Are Remaking Insurance Finance"
"Insurance Marketing and Advertising: Reaching Producers and Risk Managers"
"Insurance Marketing and Advertising: Reaching the Insurance Industry"
"What Insurance Professionals Should Know About Contractors' Environmental and Professional Coverage"
"A.M. Best Panel Reviews and Updates Capital Model Developments"
"How Insurers are Adopting and Leveraging Digital Transformations"
"Insurance Attorneys Examine the Legal, Claims and Risk Issues of Drones Part II"
"Insurance Attorneys Examine the Legal, Claims and Risk Issues of Drones"
"Making It Real: How Insurers Are Bridging the Gap Between Analytics and Operations"
"Risk Experts Review the Current State of Health Care Captives"
"What Insurance Professionals Should Know about the Unique Risk Exposures of Private Companies"
"A.M. Best Panel Updates Capital Model Developments"
"Insurance Distribution – We're All In Sales"
"Exploring the Next Phase of the Cyber Insurance (R)evolution"
"State of the Medical Professional Liability Insurance Market"
"Customer Engagement: Creating Value Through Policyholder Interactions"
"What Insurance and Athletics Professionals Should Know About Concussions"
"A.M. Best Panel Reviews Capital Model Developments"
"Succeeding in the 21st Century Insurance Sales Environment"
"What Insurance Asset Managers Should Know About Exchange Traded Funds"
"Managing Cyber Risk for Small to Medium Sized Enterprises"
"The Global Economic and Capital Markets Environment: Implications for Insurance Professionals"
"What P/C Insurers Should Know About Next-Generation Underwriting Technology & Tools"
"State of the U.S. Property/Casualty Insurance Sector"
"What Insurance Professionals Should Know About Resilience and Infrastructure when Planning Catastrophe Management"
"What Insurance Professionals Need to Know About Weather-Linked Environmental Risks"
"Industry Roundtable: What Happened at the NAIC Summer Meeting and What's Next"
"How Insurers Are Building Next-Generation Customer Engagement Platforms"
"State of the U.S. Workers Compensation State Funds"
"State of the Captive and Risk Retention Group Insurance Market"
"The Independent Adjuster and Third Party Administration: Co-existing in Today's Competitive Insurance Claims Environment"
"What Insurance Professionals Should Know About Patient Safety and Ambulatory Care"
"Harnessing the Power of Telematics"
"Advances in Managing and Modeling Flood Risk in the United States"
"Industry Roundtable: What Happened at the NAIC Spring Meeting and What's Next"
"Demystifying Privacy/Data Breach and Cyber Coverages: Understanding Coverage Differences and How it Works"
"New Developments in Data Breach and Cyber Liability"
"Industry Roundtable: What Happened at the NAIC Fall Meeting and What's Ahead"
"Industry Panel: The Future of Auto Insurance Distribution in the United States"
"The New Environment for U.S. Health Insurers"
"Captive Domicile Selection - On-Shore and Off-Shore"
"From Central Banks to Detroit: Government's Impact on the Investment Environment"
"Driving Specialty Insurance Profitability Through Better Analytics"
"Catastrophe Risk Update 2013: Extreme Global Weather Events"
"What Insurance Professionals Should Know About Abuse and Molestation Coverages"
"State-Run Workers' Compensation Funds: Their Role in the Competitive Marketplace"
"How New Rules Are Raising the Stakes on Product Contamination and Recall Risks"
"State of the U.S. MPLI Market"
"Insurance Adjusting and Legal Coverage in a Post Sandy Environment"
"La Integración del Riesgo Empresarial y Riesgo País en el Proceso de Calificación"
"Key Components of the Health Insurance Rating Process"
"Componentes Claves del Proceso de Calificación"
"Parting of the Clouds: What Cyber Insurance Buyers Want to Know"
"Attracting and Developing Tomorrow's Insurance Stars"
"Small Steps, Big Insights: How Insurers are Deploying Big Data For Real-World Results"
"Real-World ERM for Financial Institutions"
"What Insurers Need to Know About Covering Evolving Renewable Energy Applications"
"Taking the Long View: Reaching Younger Prospects With Retirement Options"
"Beyond Cats: The New Lower-Severity, Higher-Impact Loss Environment"
"What Insurance Agents and Brokers Should Know About Liability Exposures for Nonprofits"
"The Other Side of the Risk: Hospital Property Liabilities Agents, Brokers and Risk Managers Need to Know"
"Shrinking World, Expanding Opportunity: What Insurance Agents and Risk Managers Should Know About Cargo & Logistics"
"Big Data, Small Steps: An Analytics Journey from Data to Intelligence"
"State of the Global Reinsurance Market 2012"
"Economist A. Gary Shilling on Global Deleveraging and Investment Strategies for Insurance Companies"
"State of the Captive Insurance Market 2012"
"Enterprise Risk Management and the Latin American Insurance Market"
"Emerging Opportunities in Business Interruption Coverage for Insurance Agents and Brokers"
"How the Global Billing Revolution Is Remaking Insurance Operations"
"Insurance Agency Valuation 2012: The Market Returns... For Some"
This event is exclusively for Best's Review subscribers. If you are not a Best's Review subscriber, more information is available. "Catastrophic Risk Update 2012: Hurricanes, Earthquakes and Terror"
"State of the U.S. Medical Professional Liability Insurance Sector"
"How Analytics is Enabling Next-Generation Risk Management Practices for Homeowners Insurance"
"Workforce M.D. : How the Physician-Employment Movement Is Affecting Medical Liability Coverage"
"The New Legacy: Life Insurance Producers and Generational Dynamics"
"What's Driving the Spike in U.S. Insurance Impairments"
"Cyber Liability The Sequel: One Year Later, What's Changed?" "What Life Producers Should Know About the New Landscape for Variable Annuities"
"What Brokers and Risk Managers Should Know about Financial Institutions and Their Increasing Real Estate Exposures"
"The Impact of Low Interest Rates on Life and Annuity Insurers"
"What Risk Managers Should Know About Emerging Liabilities for Healthcare Captives"
"What Midsize Companies Should Know About the New Developments in Cloud Computing"
"Asset Management Perspective: Financial Crises - Danger and Opportunity"
"State of the Surplus Lines Market 2011"
"Bigger, Faster, Riskier: Advances in Sea Transportation Open Up New Coverage Needs"
"Online Global Town Meeting: New Approaches to Flood Coverage"
"What Carriers Need to Know About Growing the Midsize Insurance Company"
"Underwriting Best Practices for the Changing Asian Markets"
"What the New Normal in Catastrophe Activity Means to Risk Managers, Brokers and Insureds"
"The New Environment for Independent Adjusting"
"State of the U.S. State Workers Compensation Funds"
"Ready, Set, Launch: Building the Cutting Edge Life Underwriting Platform"
"Risk Management and Catastrophe Models"
"Food Safety: What Agents and Brokers Need to Know About New FDA Recall Authority"
"State of the Medical Liability Insurance Market"
"The E-Frontier for Property/Casualty Insurers: Leveraging Electronic Claims Payments"
"Life Insurance and Annuity Sectors"
"State of the Property/Casualty Market"
"Managing the Changing Environment for Corporate Risk Managers and Insurance Professionals"
"The Impact of Health Reform on the Medical Professional Liability Market"
"What Risk Professionals Should Know About Cyber Liability"
"State of the Bermuda Insurance Market"
"Building The Cutting-Edge Insurance-Product Development Pipeline"
"Telematics and the Changing Risk Environment for Fleets and Commercial Transportation"
"Introduction to Best's Credit Ratings for Canadian Property/Casualty Insurer"
"Emerging Compliance Risks in the Global Marketplace: What Brokers and Corporations Need to Know"
"A.M. Best's Perspective on Insurance Developments in China"
"10 Reasons Why Insurance Programs Succeed"
"Asset Management Perspective: Finding Returns in Today's Investment Yield Drought"
"What Risk Managers and Insurance Professionals Should Know about the Next Wave of Employment Liability"
"The Fast-Changing Environment for Medical Professional Liability: What Insurance and Medical Professionals Should Know"
"An Introduction to the A.M. Best Rating Process for RRGs Writing Medical Professional Liability"
"State of the Surplus Lines Market 2010"
"What Insurance Brokers, Realtors and Risk Managers Need to Know About Distressed Commercial Property"
"Mutuals and the Economic Crisis"
"A Guide to Understanding A.M. Best's Captive Ratings"
"What Risk Managers and Insurance Professionals Should Know About Today's Mounting Environmental Exposures"
"Best's Life Settlement Cash Flow Model Webinar"
"The Fast-Changing Environment for Workers' Compensation Coverage"
"Crisis Management and Risk Mapping for Risk Managers, Insurance Brokers and Agents"
"Adjusting the High-Value Insurance Claim"
"The Impact of Insurance Impairments on Agents, Brokers, Directors and Officers"
"CMO Investing Part 2: The Insurer's Point of View"
"State of the Wholesale Channel: What Insurance Agents, Brokers & Carriers Need to Know"
"Insurance Developments in the Gulf Region"
"A.M. Best Webcast: Lloyd's Syndicate Ratings"
"Medical Professional Liability After Tort-Reform Rollback: The New Landscape"
"A.M. Best Webinar: The German Pension System"
"An Introduction to the A.M. Best Rating Process For Life, Health & HMO Insurers"
"CMO Investing Part 1: Building the CMO Investment Portfolio"
"Building the Information-Based Insurance Marketing Engine"
"The Changing Risk Environment for Financial Institutions: What Brokers, Bankers and Others Need to Know"
"Underwriting Processes and Disciplines for Stronger Profitability"
"State of the Market: P&I Clubs"
"Southeast Asian Insurance Markets: A Market Review"
"State of the Medical Professional Liability Market: What Brokers, Doctors and Hospitals Need to Know"
This Webinar Highlight is based on the webinar held on February 27, 2019 and sponsored by LexisNexis Risk Solutions. This Webinar Highlight is based on the webinar held on January 23, 2019 and sponsored by Cognizant. This Webinar Highlight is based on the webinar held on May 10, 2018 and sponsored by Optymyze. Highlights from this webinar are presented in two formats: an interactive website and a printable e-book site. This Webinar Highlight is based on the webinar held on October 24, 2018 and sponsored by Cognizant. Highlights from this webinar are presented in two formats: an interactive website and a printable e-book site. 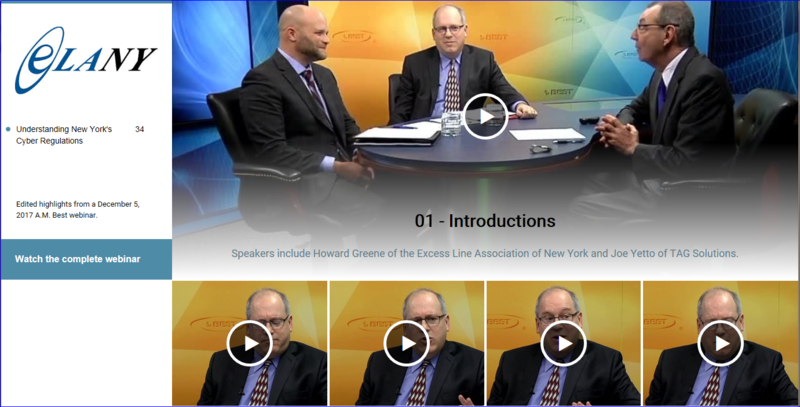 This Webinar Highlight is based on the webinar held on December 5, 2017 and sponsored by the Excess Line Association of New York. Highlights from this webinar are presented in two formats: an interactive website and a printable e-book site. 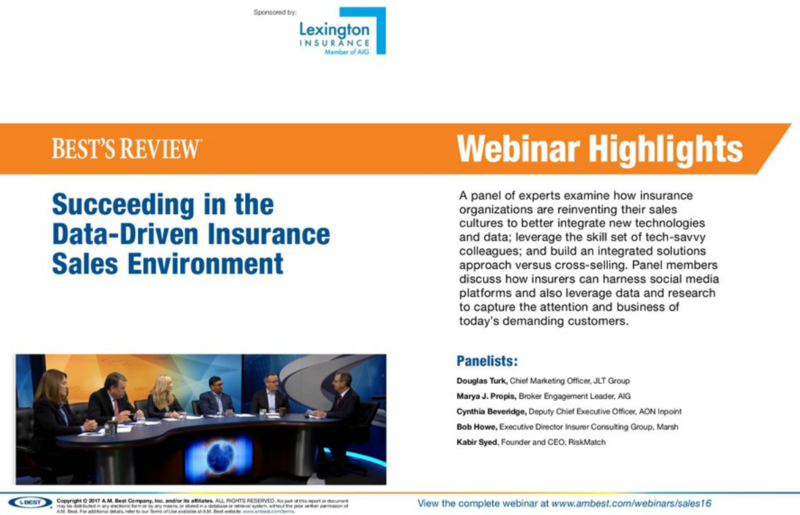 This Webinar Highlight is based on the webinar entitled, "Succeeding in the Data-Driven Insurance Sales Environment" held December 6, 2016, and sponsored by Lexington Insurance. 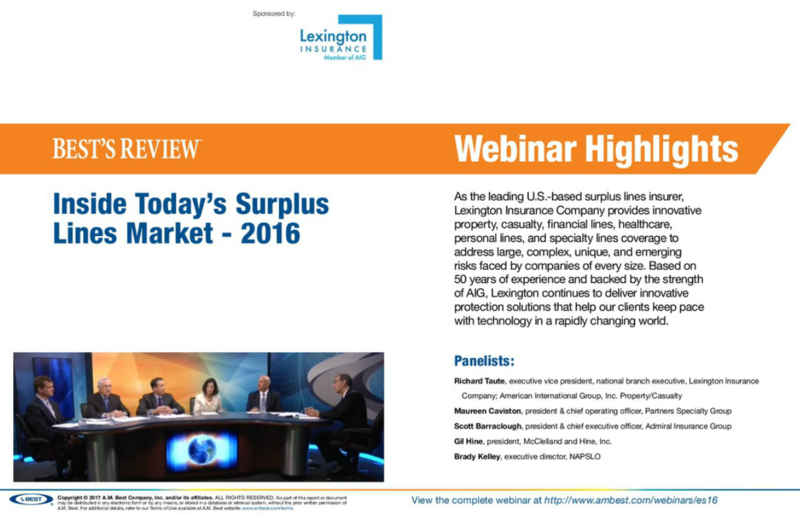 This Webinar Highlight is based on the webinar entitled, "Inside Today's Surplus Lines Market," held September 20, 2016, and sponsored by Lexington Insurance. This Webinar Highlight is based on the webinar entitled, "Helping Boomers and Aging Clients: Is Home the Best Place to Grow Old?" held February 22, 2017, and sponsored by AXA.. 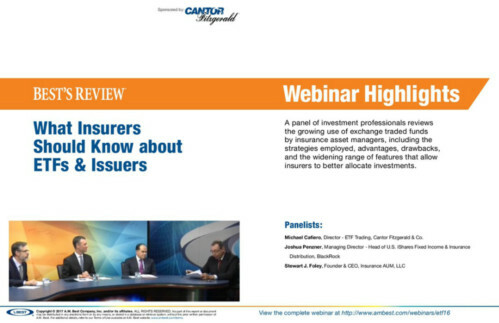 This Webinar Highlight is based on the webinar entitled, "What Insurers Should Know about ETFs & Issuers," held November 10, 2016, and sponsored by Cantor Fitzgerald. 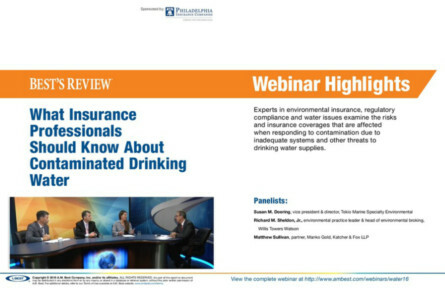 This Webinar Highlight is based on the webinar entitled, "What Insurance Professionals Should Know about Contaminated Drinking Water," held November 4, 2016, and sponsored by Philadelphia Insurance Companies. 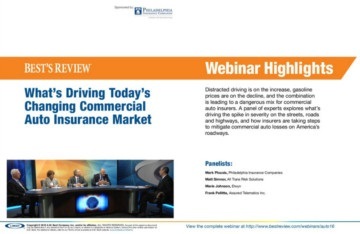 This Webinar Highlight is based on the webinar entitled, "What's Driving Today's Changing Commercial Auto Insurance Market," held June 22, 2016, and sponsored by Philadelphia Insurance Companies. This Webinar Highlight is based on the webinar entitled "How Technology and Analytics Are Remaking Insurance Finance" held December 10, 2015. 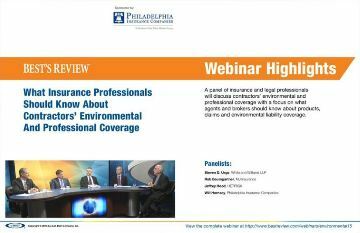 This Webinar Highlight is based on the webinar entitled "What Insurance Professionals Should Know About Contractors' Environmental and Professional Coverage" held October 28, 2015. 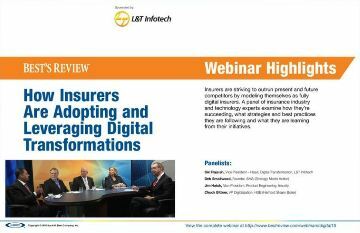 This Webinar Highlight is based on the webinar entitled "How Insurers are Adopting and Leveraging Digital Transformations" held October 14, 2015. 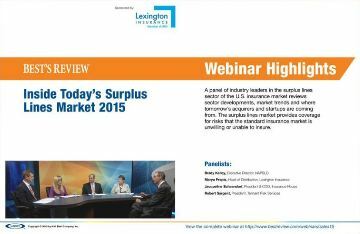 This Webinar Highlight is based on the webinar entitled "Inside Today's Surplus Lines Market" held September 2, 2015. 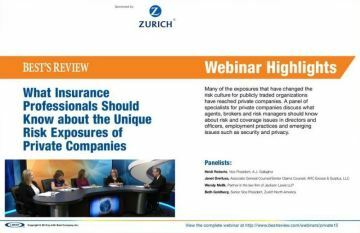 This Webinar Highlight is based on the webinar entitled "What Insurance Professionals Should Know about the Unique Risk Exposures of Private Companies" held May 14, 2015. 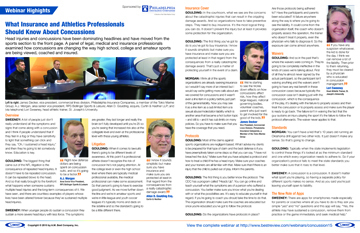 This Webinar Highlight is based on the webinar entitled "What Insurance and Athletics Professionals Should Know About Concussions" held April 21, 2015. This Webinar Highlight is based on the webinar entitled "Succeeding in the 21st Century Insurance Sales Environment" held January 22, 2015. 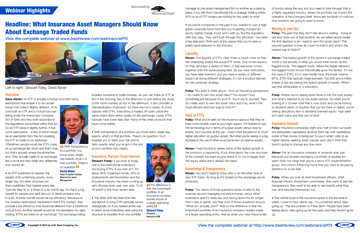 This Webinar Highlight is based on the webinar entitled "What Insurance Asset Managers Should Know About Exchange Traded Funds" held January 12, 2015. 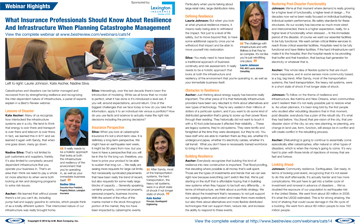 This Webinar Highlight is based on the webinar entitled "What Insurance Professionals Should Know About Resilience and Infrastructure when Planning Catastrophe Management" held October 15, 2014. This Webinar Highlight is based on the webinar entitled "Inside Today's Surplus Lines Market" held September 11, 2014. This Webinar Highlight is based on the webinar entitled "State of the Surplus Lines Market" held September 24, 2013. This Webinar Highlight is based on the webinar entitled "Catastrophe Risk Update 2013: Extreme Global Weather Events" held September 10, 2013. This Webinar Highlight is based on the webinar entitled "Programmed for Success" held December 18, 2012. 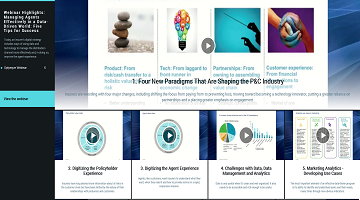 This Webinar Highlight is based on the webinar entitled "Small Steps, Big Insights: How Insurers are Deploying Big Data For Real-World Results" held December 12, 2012. This Webinar Highlight is based on the webinar entitled "Real-World ERM for Financial Institutions" held December 10, 2012. This Webinar Highlight is based on the webinar entitled "What Insurance Agents and Brokers Should Know About Liability Exposures for Nonprofits" held October 09, 2012. This Webinar Highlight is based on the webinar entitled "Inside Today's Surplus Lines Market" held September 24, 2012. This Webinar Highlight is based on the webinar entitled "The Other Side of the Risk: Hospital Property Liabilities Agents, Brokers and Risk Managers Need to Know" held September 20, 2012. This Webinar Highlight is based on the webinars entitled "CMO Investing Part 1: Building the CMO Investment Portfolio," "CMO Investing Part 2: The Insurer's Point of View" and "Economist A. Gary Shilling on Global Deleveraging and Investment Strategies for Insurance Companies," held April 19, 2010, June 16, 2010 and August 8, 2012, respectively. This Webinar Highlight is based on the webinar entitled "Innovation in Personal Lines" held June 15, 2012. This Webinar Highlight is based on the webinar entitled "Emerging Opportunities in Business Interruption Coverage for Insurance Agents and Brokers" held June 13, 2012. This Webinar Highlight is based on the webinar entitled "How the Global Billing Revolution Is Remaking Insurance Operations" held June 13, 2012. This Webinar Highlight is based on the webinar entitled "Catastrophic Risk Update 2012: Hurricanes, Earthquakes and Terror" held May 22, 2012. This Webinar Highlight is based on the webinar entitled "Workforce M.D. : How the Physician-Employment Movement is Affecting Medical Liability Coverage" held April 10, 2012. This Webinar Highlight is based on the webinar entitled "What Brokers and Risk Managers Should Know about Financial Institutions and Their Increasing Real Estate Exposures" held December 07, 2011. This Webinar Highlight is based on the webinar entitled "What Midsize Companies Should Know About the New Developments in Cloud Computing" held November 03, 2011. 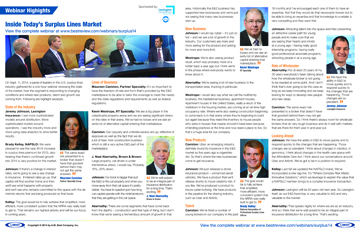 This Webinar Highlight is based on the webinar entitled "State of the Surplus Lines Market 2011" held September 28, 2011. This Webinar Highlight is based on the webinar entitled "Bigger, Faster, Riskier: Advances in Sea Transportation Open Up New Coverage Needs" held September 27, 2011. This Webinar Highlight is based on the webinar entitled "What the New Normal in Catastrophe Activity Means to Risk Managers, Brokers and Insureds" held July 14, 2011. 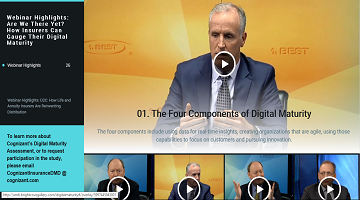 This Webinar Highlight is based on the webinar entitled "Products, Programs and Platforms" held May 03, 2011. This Webinar Highlight is based on the webinar entitled "The Impact of Insurance Impairments on Agents, Brokers, Directors and Officers" held February 03, 2011. This Webinar Highlight is based on the webinar entitled "10 Reasons Why Insurance Program Businesses Succeed" held October 14, 2010. This Webinar Highlight is based on the webinar entitled "State of the Surplus Lines Market 2010" held September 20, 2010. This Webinar Highlight is based on the webinar entitled "CMO Investing Part II The Insurer's Point of View" held June 16, 2010. Sponsor a webinar to leverage AM Best's insurance industry insight and speak directly to an influential audience to showcase your company's expertise in a popular multimedia setting. Take advantage of AM Best's 100-plus years of unmatched expertise and experience and our unique relationship with the insurance industry. We provide whatever level of guidance, customization and information you prefer, whether you have a webinar topic in mind, would like help selecting a topic or want to sponsor an already scheduled webinar. Exclusivity as the webinar sponsor. Additional exposure from Best's Review's promotional efforts. Guidance in selecting the topic and choosing panelists. with your company's URL made available during the webinar. Continued exposure in the webinar archive, posted on AM Best's Web site for at least one year. A link to the webinar playback, posted on AM Best's Web site for at least one year. A list of registrants for the live webinar and of visitors to the archived playback, for at least one year. 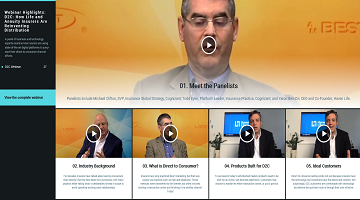 The option to sponsor webinar highlights. For inquiries about our Best's Review Webinar sponsorship opportunities, contact Advertising Sales at (908) 439-2200 ext. 5399.